David Wills, the Chief Operating Officer (COO) and Co-Founder of Caspian talks in depth about the full-stack crypto asset management platform in an exclusive interview with Blokt.com. Caspian, the complete asset management solution, recently completed a $19.5 Million token sale early. They are aiming to become the lead player in facilitating institutional clients crypto trading activities. They have amassed some impressive strategic partners along the way including Galaxy Digital, Michael Novogratz, B2C2, Coinbase, BitMex, Octagon, Gemini and many more. Recently Blokt reached out to David Wills, the COO, and co-founder of Caspian. David covers various topics in the interview including Caspian’s joint venture origins, how the funds from the token sale will be used, and also the opportunities that lie ahead for Caspian. David also outlines the vision for Caspian and how it can place itself as a leader in servicing institutional clients. Could you introduce yourself and tell us about your role at Caspian? I’m David Wills, the Chief Operating Officer (COO) and Co-Founder of Caspian. I also serve as COO of Kenetic, one of the joint venture partners behind Caspian. Prior to joining Kenetic, I spent 10 years as Managing Director and Head of Asia Trading at Och-Ziff Capital and was also the chairperson of HKEX’s hedge fund market council. Could you tell us what Caspian is all about in a few sentences? Caspian is a full-stack crypto asset management platform that ties together the biggest crypto exchanges in a single interface. The platform also offers compliance, algorithms, portfolio management, risk, and reporting. It is a joint venture between Tora and Kenetic, which both have a wealth of experience in asset management that has been accumulated over decades of building and operating trading platforms and technologies as well as managing portfolios of different asset classes including cryptocurrencies. Our development team is leveraging the capabilities and resources of two existing, successful financial businesses to build an ecosystem that enables professional traders and investors to operate more efficiently and improve their performance. Caspian just completed a successful $19.5m token sale early, could you tell us about that and how the funds will be used? We’re extremely pleased with the results of our token sale, which will help us to achieve the key milestones in our development roadmap. It is this area where most of the funds raised will be focused, with 40% earmarked for technology, research, and development. 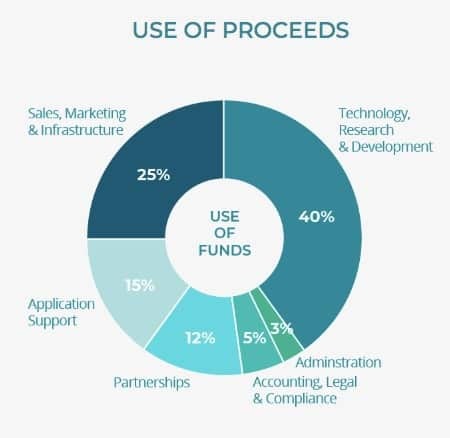 We have reserved 25% for sales, marketing, and infrastructure, 15% for application support and 12% for developing partnerships. Finally, 5% of the funds are reserved for accounting, legal and compliance, as well as 3% for administrative costs. Caspian is “institutionalizing crypto asset management,” what effect will that have on the market/industry? We believe the effect that Caspian will have on the asset management industry will be broad and transformational. Many people have commented throughout 2018 that one of the major trends within cryptocurrency trading is the influx of institutional and sophisticated investors. However, building the appropriate systems that allow these users to access crypto markets in a way that is familiar and friction-free is another matter. Caspian is perfectly placed to do exactly that, firstly because of the experience we have in meeting investor needs within traditional finance markets, and secondly because of our technological capacity to connect them to the best prices within a fragmented cryptocurrency environment. One example of where our experience counts is in the Over The Counter (OTC) market, which many sophisticated investors are currently using to buy and sell large amounts of Bitcoin. This activity, which is typical in traditional finance markets, takes place completely separately from exchanges but accounts for a huge volume of Bitcoin. However, our partnerships with OTC specialists’ B2C2 and Octagon shows how well Caspian is positioned to facilitate this activity. Could you tell us about the Caspian institutional grade trading platform? The Caspian institutional grade trading platform sits between institutional investors and the cryptocurrency exchanges they want to access in order to trade. It includes a fully developed OEMS, PMS, and RMS with compliance monitoring tools. It provides a single interface into all major crypto exchanges, a complete suite of sophisticated trading algorithms through a Smart Order Router, real-time and historical P&L and exposure tracking, and 24/7 customer service. Caspian has some impressive strategic partnerships, could you tell us about those? You’re right to say that our partnership strategy so far has been very successful, with a number of exchanges, investors, technology providers and advisors all having chosen to join us on this journey. Our most recent partnership was with OTC trading specialist B2C2 will make it much easier for larger investors wanting to increase their exposure to cryptocurrency markets. This built on another major recent partnership we signed with Coinbase, which was aimed at assisting the growing number of financial institutions seeking to trade cryptocurrencies. Other key strategic partnerships in this space that we have signed during 2018 include those with Galaxy Digital, which included CEO Michael Novogratz advising our company, BitMEX, which is Bitcoin’s most advanced peer-to-peer trading platform, Octagon, Asia’s largest digital asset brokerage and Gemini, the licensed digital asset exchange. Finally, it’s worth mentioning some of the fantastic advisors we have brought on board. These include Ari Paul, the Co-Founder of BlackTower Capital, who joined our advisory board in August. Other advisor additions in August included Satoshi Kobayashi and Willy Woo, who joined the earlier appointments of Ivan Damgård, AirSwap’s Michael Oved And MelonPort’s Mona El Isa. As mentioned in our ICO plans, the main priority is to continue onboarding new customers efficiently. As we do that, our technology focus will be to build out features for institutional clients that are seeking to invest money into cryptocurrencies in volumes that haven’t been seen before. We want to build a system that will encourage institutional money into this asset class whilst deepening our integration with major partners that help us to meet demand. As a global provider, we are focused on building out our operations across the world to serve these clients with a 24/7 approach. In the upcoming months, we aim to sign up many more partners to the platform, as the more integrated the solution becomes, the greater impact Caspian will have on trade/industry. What has been your biggest challenge so far working for Caspian? There have been so many successes in the journey so far that I wouldn’t want to dwell on the challenges too much. However, anyone that has been through the process of raising money through an ICO will tell you that is an interesting one with a host of unique challenges. When you consider the volatility of cryptocurrency markets of late, as well as the general bearishness that has consumed them, we really do consider the fundraising we achieved to be a major success. Where do you see Caspian being in 5 years? As the go-to-platform for institutional investors that want to access cryptocurrency markets. We’re completely confident that this type of investor will be increasingly focused on the cryptocurrency markets in the coming years and we’re perfectly positioned to help them take advantage. Right now, these investors are regularly accessing traditional finance markets on a daily basis using tools that make trading quick and easy. In five years time, they’ll be accessing cryptocurrency markets in exactly the same way, using Caspian. David Wills is Caspian’s COO and Co-Founder. He has served as Kenetic COO since inception. Prior to that David spent 10 years as Managing Director and Head of Asia Trading at Och-Ziff Capital and was the former chairperson of HKeX Hedge Fund market council. David holds a B.A. in Psychology and B.Comm. in Finance & Economics from the University of Sydney.